Patriotic Front (PF) Secretary General Davies Mwila has dissolved the Mungwi District and Malole Constituency Committees in the wake of the ruling party’s embarrassing failure to field a candidate in the Mfinshe Ward by-election. And Mwila has removed PF Chairperson for Mines and Malole MP Christopher Yaluma from the Central Committee for allegedly failing to attend meetings. Meanwhile, Mwila has given Northern Province PF Executive Committee Chairperson Lazarus Chungu an ultimatum of seven days in which to exculpate himself in writing or have the provincial committee dissolved. 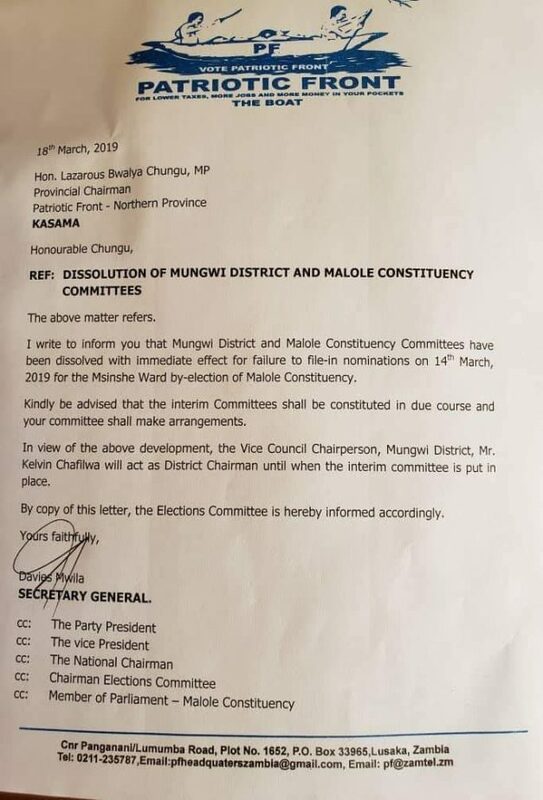 In a letter dated March 18, 2019, Mwila informed Chungu the Mungwi District and Malole Constituency Committees have been dissolved with immediate effect. “I write to inform you that Mungwi District and Malole Constituency Committees have been dissolved with immediate effect for failure to file-in nominations on 14th March, 2019 for the Mshinshe Ward by-election of Malole Constituency. In light of the above development, the Vice Council Chairperson, Mungwi District, Mr. Kelvin Chafilwa will act as District Chairman until when the interim Committee is put in place”, the letter read on part. And Mwila has informed Yaluma in a letter of the decision to remove him from the PF Central Committee. He further thanked the Minister of Commerce and Malole MP for the services rendered to the party as Chairperson for Mines. 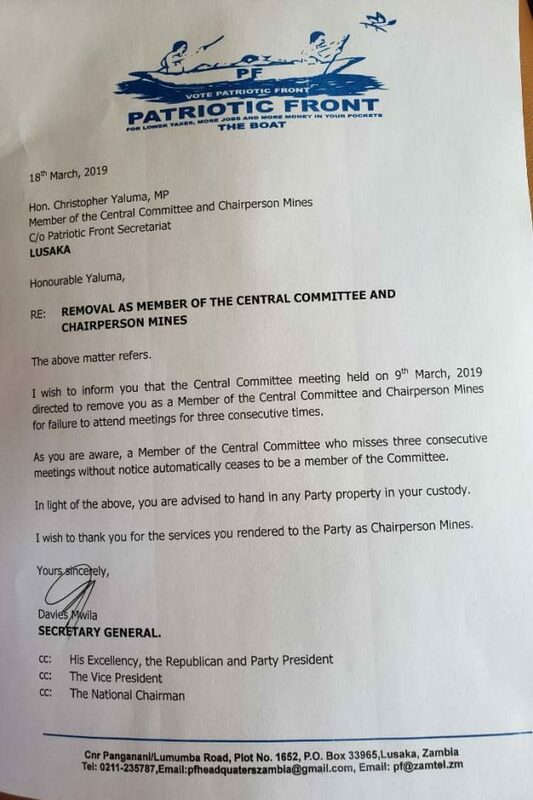 “I wish to inform you that the Central Committee meeting held on 9th March 2019 directed to remove you as a Member of the Central Committee and Mines Chairperson for failure to attend meetings for three (03) consecutive times. As you are aware, a Member of the Central Committee who misses three (03) consecutive meetings without notice automatically ceases to be a member of the Committee,” read the letter to Hon Yaluma. Meanwhile, in another letter to Lazarus Chungu, Mwila has given the PF Northern Province chairperson seven days in which to give him convincing reasons, in writing, as to why the provincial committee should not be dissolved. “The Party has noticed with dismay the action by your Committee’s failure to supervise and file-in the nominations for the Ward by-election in Mungwi District. This action has been found not to be in line with the responsibilities of the Provincial Executive and further violates regulation 29 of the Party Constitution,” the letter reads in part. Mwila has since warned PF structures across the country to live up to the expectations of the general membership by continuously working for the growth and unity of the Party. 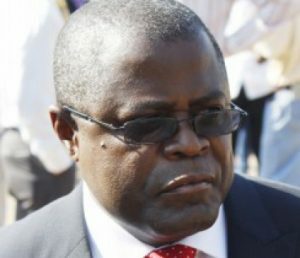 On March 9, 2019, PF candidate Joseph Mulenga failed to file in his nominations after he was sent back by the Electoral Commission of Zambia (ECZ) over his failure to produce all required documents and later got himself involved in a road traffic accident. They do well amongst themselves , but when the General public complains about the amplification of resources spent on buying fire tenders and road construction they say nothing . If the government was as efficient as PF is we would have developed this country along time ago.